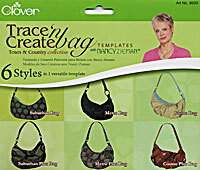 The Town & Country Bag Templates by Clover is a fun and easy to use template that has instructions for 6 different styles of handbags! The bag styles range from sophisticated to fancy and there is even a video to help guide you along that can be found at Clover. The designs include the Suburban, Suburan Plus, Metro, Metro Plus, Cosmo, and Cosmo Plus.